Grizzly H3189 - Cast Iron Handwheel - 6"
I ended up picking up a cpl of these to replace the garbage plastic OEM ones on my Cman 113 saw. I was a little lerious whether they would work because I ran across a few unhappy reviews because of difficulties modifying the fit. Well they arrived today and I couldn’t be happier! The are nice stuffy and turn real smoothly. Installation was a breeze and I don’t see why some would complain. As long as you have a drill press just bore the center hole to 1/2” then pop a 1/4” 20tpi tap in your drill press and use it to tap the side for a set screw and that’s all. I don’t have much experience with milling and the process should be easy enough for most LJs. So if your in search of some replacement handwheels these are by far the best bang for your buck. -- Sometimes you're flush and sometimes you're bust, and when you're up, it's never as good as it seems, and when you're down, you never think you'll be up again, but life goes on. Thanks for this review, I’ve had my eye on these to replace the crappy wooden hand wheels I fabricated for my Moxon vise. 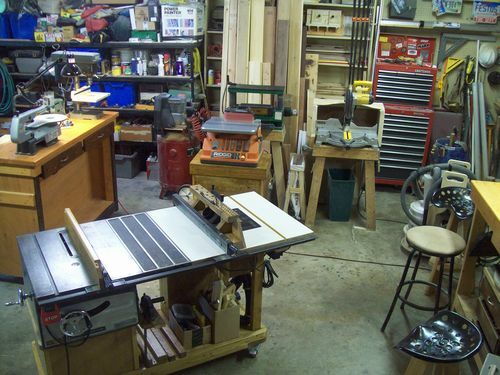 I have an old C-man tilt head band saw with of course the plastic hand wheel. During the move to Ariz. the hand wheel got broken. No longer available from Sears I tried the Grizz. Like you I drilled for the shaft and set screw and wholla! we’re back in business stronger than ever. +1 on Jerry’s by line. It amazes me that these handwheels don’t come standard on all contractors grade tools and up. They were like 16$ a piece and I’d rather pay the extra 30 up front then replace plastic down the road. I need a pair of these for my old crapsman table saw as well, those plastic wheels have been driving me nuts. Did you also buy the handle attachment, and if so does it pivot while turning smoothly? I’ve been wanting a better knob for the adjustable angle sculpting table I have because the small 2” plastic knob I currently use is difficult to tighten. It has a 7mm” bolt that the knob tightens on and this large hand wheel seems like it would be perfect since it needs to be drilled out and tapped. Just ordered one online…thanks for the idea…! Yes BoB I ordered 2×6” handwheels and 2×4” handles. A 10” craftsman could handle the 8” wheels if you felt so inclined but I think it would look out of balance. Plus the 6” are already like 10x better than the OEM’s. The handles do pivot and all you need for installation is drill press, 1/2” drill bit plus 1/2” reamer, 3/16” bit and a 1/4-20 tap bit. If you don’t want to mess with the reamer go with a 17/32” drill bit because drill bits are usually a little undersized. I paid right around 42$ with delivery for all 4 parts. After you install these guys you will wonder why didn’t I do this a year ago … I did. I have both the 6” and the 4” version with the chrome handles on my old Craftsman TS. As said they are great and easy to machine to fit your application. The 4” one does not come drilled for a handle but that also was easy to drill and tap the hole for it. This pic was before I got the chrome handle for the 6” wheel. I have the 8” one on my Grizzly wish list (just in case Santa is looking for any ideas) for use on a leg vise I hope to build from ACME threaded rod. Have you found a supplier for your Acme Thread?? Every where I look it’s pretty expensive stuff, putting my leg vise back a bit.